Linköping, Sweden and Odense, Denmark – April 15, 2019 – International medical imaging IT and cybersecurity company Sectra (STO: SECT B) has signed a digital pathology contract with the Region of Southern Denmark. 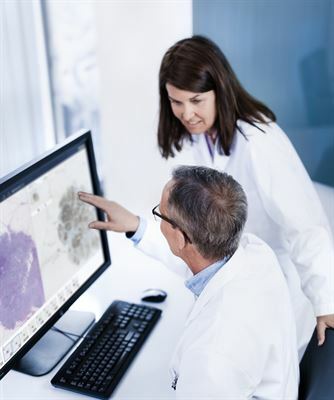 The IT solution for handling digital pathology images will enable pathologists at the region’s four hospitals to review and collaborate around cases in a way that is not possible with microscopes. This will increase efficiency in primary diagnostics, thereby improving cancer care. The Region of Southern Denmark is the first Danish healthcare region to digitize pathology in full scale. With this digital pathology solution, resource utilization and sub-specialization will be optimized at the four geographically dispersed hospitals. This will enable the region to provide all patients, regardless of location, equal access to healthcare services. “We look forward to supporting Region Syddanmark in their quest to improve patient care with our digital pathology solution and experience from other pioneers in the field. The region is taking an important step towards the global forefront of digital pathology,” says Sune Henriksen, President, Sectra Denmark. The solution will handle approximately 200,000 examinations per year. The contract, worth DKK 17 million (corresponding to approx. EUR 2,3 million), was signed in April 2019. Digitizing pathology brings pathologists new functionality beyond the microscope. Without the need for physical glass slides, digital access enables them to instantly access and share current and historical images and information between departments and hospitals. The digital solution provides pathologists with assistance at critical decision points, such as grading or doing more precise measurements. It also enables image analysis, which in turn reduces variation and improves the precision of tasks such as cell counting. The digital access further facilitates second opinions, external reading resources, and specialist consultations. Sectra’s pathology solution is part of its enterprise imaging offering. It provides a unified strategy for all imaging needs, and improves patient outcomes while lowering operational costs. The scalable and modular solution supports the most image-intense departments—radiology, breast imaging, pathology, cardiology and orthopaedics. Being built on the same technical platform, customers can easily extend a departmental solution to create a comprehensive VNA. Read more about Sectra’s enterprise imaging solution and why Sectra PACS is “Best in KLAS” at https://www.sectra.com/medical/. Sectra’s digital pathology solution includes digital tools which enable pathologists to make their diagnoses and carry out reporting with higher precision and less time spent per case. It is a complete, vendor-neutral solution for primary diagnostics that includes storage solutions and an advanced review workstation. Watch this video to learn more about how digital pathology can enable increased efficiency and higher precision for the pathologists. Sectra assists hospitals throughout the world to enhance the efficiency of care, and authorities and defense forces in Europe to protect society’s most sensitive information. Thereby, Sectra contributes to a healthier and safer society. The company was founded in 1978, has its head office in Linköping, Sweden, with direct sales in 19 countries, and operates through partners worldwide. Sales in the 2017/2018 fiscal year totaled SEK 1,267 million. The Sectra share is quoted on the Nasdaq Stockholm exchange. For more information, visit www.sectra.com.